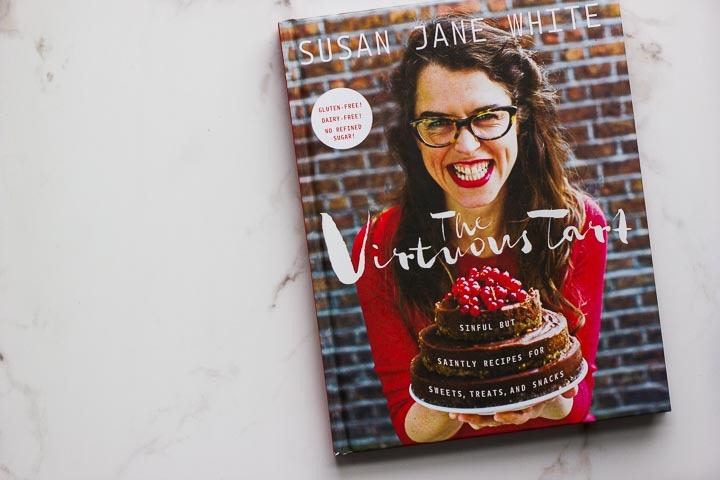 If you’ve ever wanted to laugh your way through a recipe and give your body a nutritional slam dunk at the same time, then Susan Jane White is the lady for you. I was first introduced to Susan when she released her first book, The Extra Virgin Kitchen. I was living in France at the time, and we ordered a copy to keep in the library of cookbooks in the small cafe where I worked. Truth be told, she had my heart at tahini ice cream. In her second cookbook, The Virtous Tart, Susan shares sinful but saintly recipes for sweets, treats and snacks – and yes, there’s even a recipe for healthy halva. 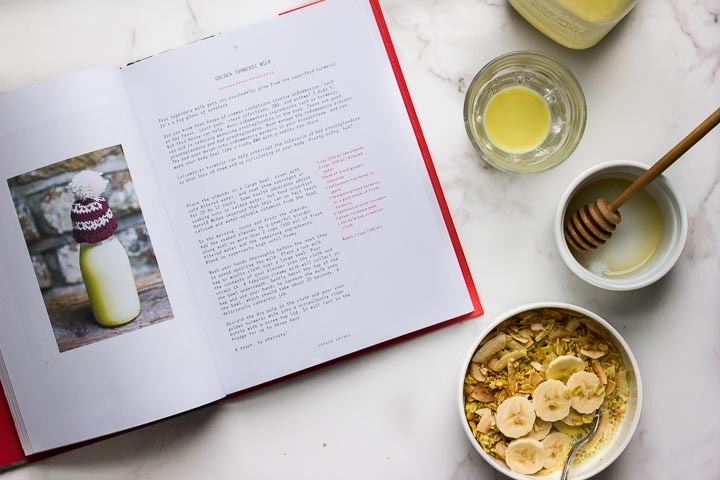 Every recipe is gluten, dairy and refined sugar free and the book is loaded with a tremendous amount of nutritional (fun) facts. What I love most about Susan’s books is her hilarious sense of humor and her ability to make everyone feel included in the world of health and wellness. She doesn’t dare sacrifice taste for nutrition, and proves that your really can have your cake and eat it too. 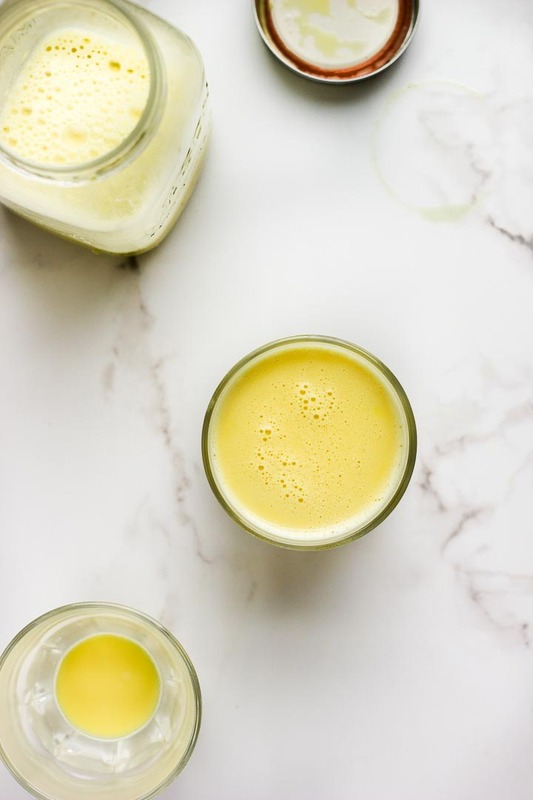 It’s been a bit of a grey spring so far, so when I saw the recipe for the Golden Turmeric Milk I knew it was something that would bring a little bit more sunshine to these rainy days. It’s a simple blend of just a few ingredients, and the result is creamy and delicious – like liquid gold. I’m not one to waste, so I went ahead and took the dry pulp from the milk and turned it into a bright and crunchy granola. The two together will brighten the darkest of mornings. GIVEAWAY (CLOSED) – Enough about me, I want you to have a copy of this cookbook in your kitchen too! The kind people of Roost books have so generously offered to giveaway 5 copies of the Virtuous Tart Cookbook. To enter, simple leave a comment below and let me know your favorite way to use turmeric. Or if you’ve never used it, simply say hi. Giveaway open to CANADA and US residents only. Winner will be announced Tuesday, April 25. May your weekends be golden + bright. Whenever I make homemade nut milk at home, I always try to come up with ways to use the leftover pulp. 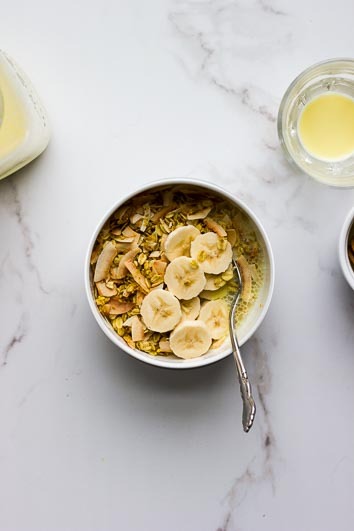 Granola is my go-to, and it becomes somewhat of a never ending circle; make milk, make granola, need more more milk for granola, need more granola for milk and so on. 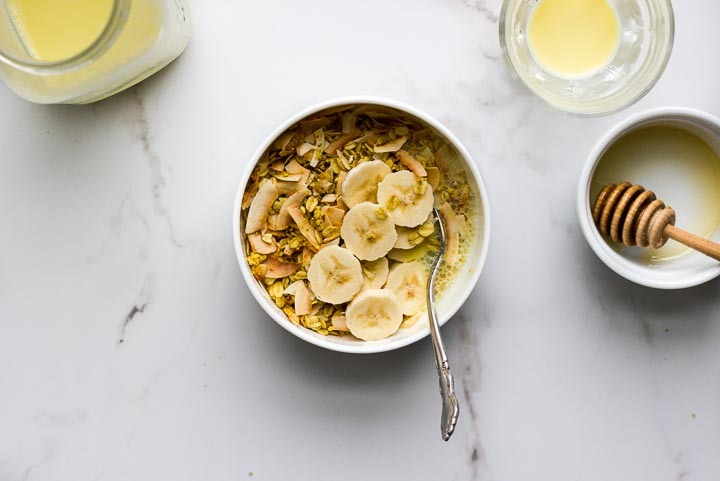 The granola recipe below is pretty adaptable to any leftover pulp, so if you make a lot of nut milk at home you could easily use this as a base. Here I stir the honey into the granola at the very end, I find you end up needed less honey for sweetness this way. But the milk alone is worth a try. You don’t need a crazy powerful machine or fancy blender to make nut milk, any blender or food processor will do. If you do make this in a vitamix, I might imagine that your pulp might be smoother and a bit more dry than mine here. You can add a touch more coconut oil, lower the oven temp and back for longer if need be. Place the almond in a large bowl, cover with cold filtered water and soak them overnight or for 10-12 hours. In the morning, rinse and drain the almonds. Add the soaked almonds to a powerful blender along with no more than 2 cups of filtered water and the remaining ingredients. Blend on high until foamy. Wash your hands thoroughly before the next step to avoid spoiling the milk. Place nut milk bag or muslin cloth over a large bowl. Pour the contents of your blender into the cloth and strain it. A fabulous creamy milk will collect in the bowl underneath. Gently twist the top of the bag and use your hands to squeeze the milk into the bowl, which should take about 20 seconds. Pour golden turmeric milk into a clean bottle. Keep sealed in the fridge for three days. Add dry pulp from the turmeric milk and oats to large mixing bowl and stir to combine. Add in the melted coconut oil, vanilla, lemon juice and salt and stir until everything is well coated. Transfer mixture to a baking sheet lined with parchment and bake in the oven for 15 minutes, then toss the granola and rotate the pan to prevent burning. Add in the coconut then return to the oven for another 15 – 20 minutes or until light brown and crisp. Transfer granola back into a large mixing bowl, stir in the honey then return to the parchment lined baking sheet to cool and dry out. Once completely cooled store in a sealed container for 1 week. How interesting. I had only used turmeric when making pickles. I would love to learn more about using it in other ways. 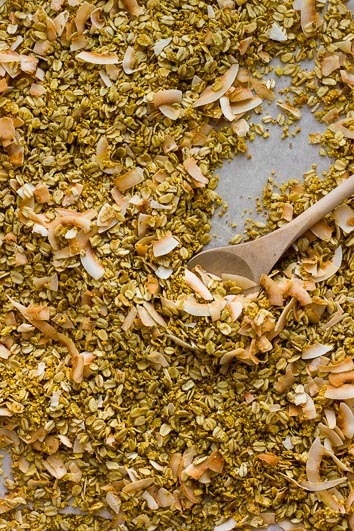 I hadn’t thought of using nut milk pulp in granola – brilliant! 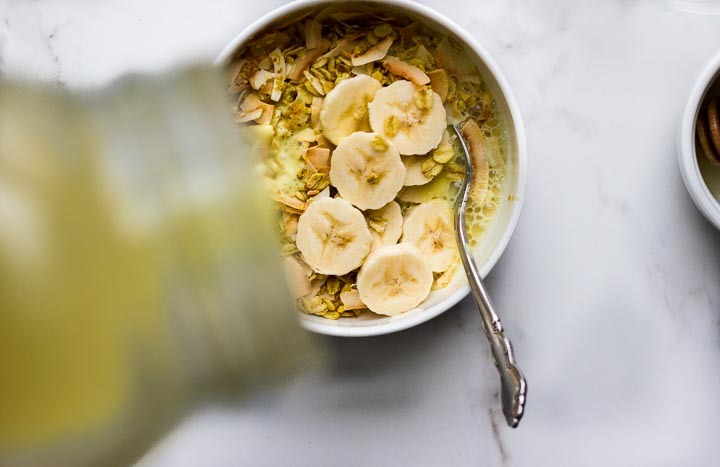 Turmeric… in golden milk inspired everything – chia pudding, Panna cotta and the bomb… ice cream!! I always use turmeric in lentil soup! I also add it when making lemon ginger tea. I love these new ideas! The granola sounds delightful. Oh I love turmeric in lentil soup! Thanks for stopping by, Kennedy! I put turmeric in everything! From my morning porridge to my savory dinner bowls :) I go through bottles and bottles! Oh you’ll love it, Karlie! You should check it out for sure! This looks and sounds amazing! I know all about the benefits of turmeric and love the flavor, but I have yet to try golden milk! This will need to change! I have a few ways I like to use turmeric. First, it’s the best cure for headaches, so it’s my go to “medicine” to treat them. It’s incredible how effective it is. I have some family and friends who have suffered from migraines for years and couldn’t live without medication. Turmeric supplements have been life changing for them. Love the powers of mother nature!! I also love to make lemon turmeric tea, to sip on during cozy winter afternoons. 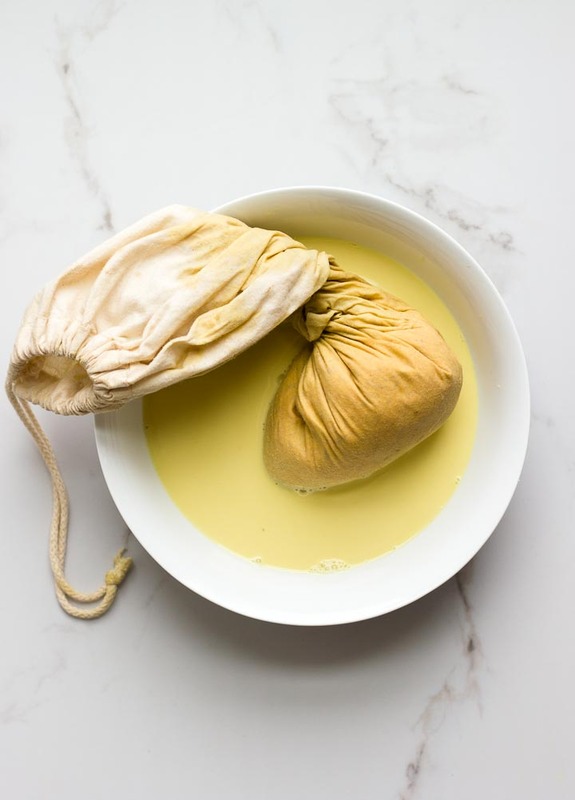 I always add it to my curry and savory pumpkin dishes, and of course when making cheese sauce or vegan lemon bars to add that beautiful sunshine-y color. A true two-fer! I love finding ways to repurpose leftover pulp from making nut milk. Can’t wait to try! I’ve never used turmeric before but I’ve been wanting to try for years! I’d like to use it to make my Chia Puddings and oatmeal yellow and good for Instagram photo shoots! I haven’t gotten too adventurous with turmeric – I use it in Indian dishes. This recipe looks really good though! I enjoy my turmeric latte every night after dinner. I also add some black pepper in it since it’s synergetic with turmeric, improving its benefits so so much! I love using turmeric when making my favorite superfood “eggnog”!! It’s also a must have for scrambled tofu!! Oh I love cauliflower and turmeric together! Thank you for saying hi, Heather! I love using turmeric with my scrambled tofu! Gives it great color. Great idea, Natasha! Turmeric is definetly nature’s food coloring! Mango and tumeric cheesecake! Nom nom NOM. It’s scrumdiddlyumptious. The turmeric nicely offsets the sweetness of the mango and gives it that pow pow 💥 effect! Would love ❤️ a SJW book for my goodness shelf! I love turmeric in my dahls! 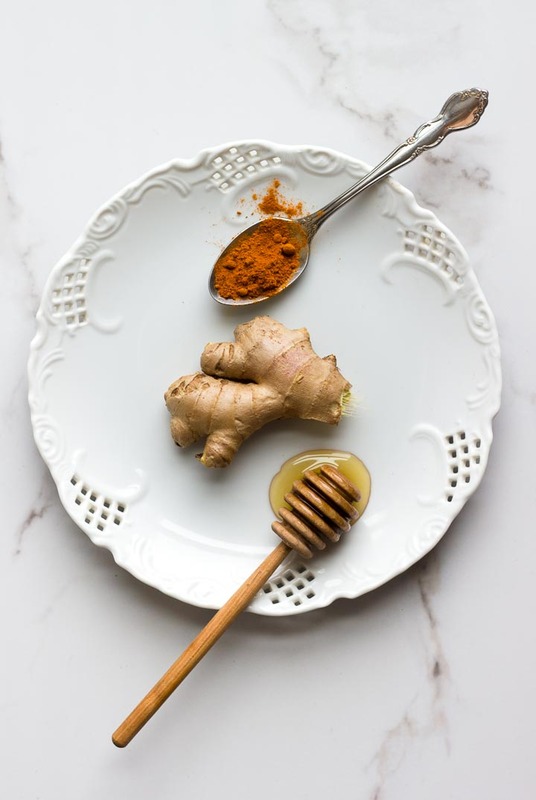 And also when I make ginger, lemon and turmeric tea – it’s so good on the stomach and digestion! I look forward to my golden milk every evening. It is simply delicious and I always feel like I’m sleeping in a down of feathers. oh that granola looks so good. Is there something I can use instead of the nut pulp? I don’t have a blender so can’t make that and I’m not sure what the nut pulp is like so I don’t know what to substitute. Thanks. I don’t use turmeric though I should due to inflammation…. HI Jacquie. I imagine you could maybe substitute the nut pulp with ground almonds + the dry spices, but the ground almonds will contain more moisture/oil than the pulp so you might need to add less oil. Would love to know how it goes! i loveeee throwing some turmeric magic into a citrus smoothie !! i gotta try that golden milk recipe, it looks deliiiiiicious ! This looks delicious! I have been drinking turmeric lattes so I can’t wait to give this recipe from scratch a try! Ah turmeric lattes are so good. Thanks for stopping by, Sarah! This book looks great! I feel like I can’t live without turmeric in daal or curries. One of my favourite recipes from the past 6 months is Julia Turshen’s coconut lentils. I left out the turmeric by accident once and they weren’t the same. Jode! These photos are totally stunning! Love the golden yellow hue through it all, and totally genius to reuse the pulp. Nailed it! I need more tumeric in my life. I use it when I make stock or soups. Love Sarah’s videos — hilarious — and presume her book of incredible recipes matches that on-screen wit! I often add a sprinkle of turmeric to anything with dark chocolate for a spicy contrast, but also dig it in a banana smoothie with cardamom, tahini and rosewater. Thanks, and cheers! I love using turmeric in dips to add colour and I love adding it to elixirs when I’m feeling on the edge of a cold! Would love this cookbook! I love using turmeric in a simple tahini dressing with just tahini, lemon juice and turmeric. But this recipe looks amazing! I’m using it in a soups. I love juicing with turmeric. I LOVE it! Use it in soups and stews. I’m lucky as I can buy the root fresh :) I grow some in the garden too, but my dogs always get to it before me- that and the strawberries!! I am so happy to find a recipe for nut milk and what to do with the left overs- I have never made my own ’cause I couldn’t justify the waste- now I get granola instead- genius!! I take turmeric as a supplement. Love this recipe! I’ve used it to make Fire Cider. Ooh my gosh I love her blog! I’ve made her miso caramel sooo many times. And my favorite way to use turmeric would be in curries. I throw it into the food processor when I’m making hummus as well! I like using turmeric in carrot or acorn squash soup to add a depth of flavor. Hi Christine! Thank you so much for introducing me to Joy at Joyous Health – I always love finding more inspiring people out there. Enjoy those turmeric lattes. I’ve never used tumeric before, but lately I’ve been seeing it used so many different ways by so many people. It’s about time that I try it out! I love turmeric, but my favorite will probably always be in some sort of curry-ish dish with rice. Aside from golden milk ( with home -made cashew milk) I love using turmeric in hummus! I also add blackbpepper, garlic- flax oil, ginger, tahini and lemon juice to soaked chickpeas . Delicious! I’ve only used turmeric for colouring rice. I didn’t know there were so many ways of using it. I love tumeric. When I have some fresh, I usually add it to juices. The powdered stuff goes …….in almost everything else! But I have yet to try golden milk. What am I waiting for?